The actor Theo Lingen was born as Franz Theodor Schmitz in Hannover. He made his theater debut at the Boulevardtheater Schauburg in Hannover in 1921. In the following years he played among others at the Stadttheater Münster, at the Neues Theater in Frankfurt and from 1931 at different places in Berlin. He didn't confine to the play on the stage but also wrote own plays which he directed himself. The film called him up in 1930 and it began an enormous busy time which was lasting till to the 70's. At the beginn of his film career he also appeared in dance and gangster movies in which he wasn't employed as a comedian, so in "Dolly macht Karriere" (30), "Das Flötenkonzert von Sanssouci" (30), "M - Eine Stadt sucht einen Mörder" (31), "Die Gräfin von Monte Christo" (32), "Der Orlow/Der Diamant des Zaren" (32) and "Das Testament des Dr. Mabuse" (33). But the funny effect which Theo Lingen's performance had to the public, wasn't to miss. From 1933 the comedy movies became his domain and Hans Moser became an important partner with whom he played together in more than 20 movies. His often played figures like servants and dignitaries enjoyed a huge popularity and the German comedies weren't any longer imaginable without Theo Lingen. Theo Lingen directed his first movies from 1936, first some short movies round Till Eulenspiegel like "Wie Eulenspiegel sich einmal erbot, zu fliegen" (36) or "Wie Eulenspiegel ein Urteil spricht" (36), later also followed feature movies like "Herz modern möbliert" (40), "Frau Luna" (41) and "Liebeskomödie" (42). to his well-known movies till the end of war belong "Die Finanzen des Grossherzogs" (33), "Herr oder Diener" (34), "Der Himmel auf Erden" (35), "Der Kurier des Zaren" (35), "Der Mann, von dem man spricht" (37), "Die verschwundene Frau" (37), "Der Tiger von Eschnapur" (37), "Das indische Grabmal" (37), "Tanz auf dem Vulkan" (38), "Sieben Jahre Pech" (40), "Johann" (42) and "Schuss um Mitternacht" (44). After the war he went on tour through Austrian cities. In 1946 he got the Austrian nationalty and he continued his theater career in the German-speaking Europe till to the 70's. The post-war film offered Theo Lingen especially at the beginning interesting roles, so "Der Theodor im Fussballtor" (50), "Es schlägt 13" (50), "Die Diebin von Bagdad" (52), "Heidi" (52), "Der Mustergatte" (56) and "Familie Schimek" (57). But the German entertainment film sagged more and more into triviality and dragged the in comparable comedian with it. Theo Lingen often impersonated hypernverbous characters whose comic effect only moved on the surface, more demanding roles were exceptional. 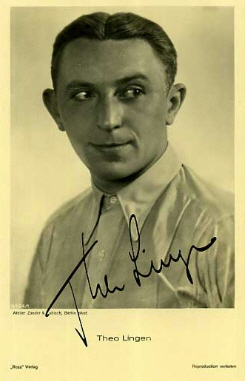 Still the comedies and slapstick movies enjoyed great popularity and maintained Theo Lingen's fame. To his well-known movies of the next years belong "Die Beine von Dolores" (57), "Pension Schöller" (60), "Der Teufel hat gut lachen" (60), "Die Lümmel von der ersten Bank" (68), "Pepe, der Paukerschreck" (69), "Hurra, die Schule brennt" (69), "Die Feuerzangenbowle" (70) and "Immer Ärger mit Hochwürden" (72). In the 60's he got the chance to show his acting repertoire for television where he was able to impersonate serious roles too like in "Die Kassette" (61), "Minna von Barnhelm" (63), "Tonio Kröger" (64) and "Was ihr wollt" (68). Theo Lingen's last works comprise among others the serial "Klimbim" (74), "Lady Dracula" (75) and the serial "Zwei himmlische Töchter" (78). Theo Lingen was married with the singer Marianne Zoff since 1928. Their daughter Ursula Lingen became also an actress.